Book of Ra Tricks | Are There Any? When I was writing our Book of Ra review I’ve noticed 100s of sites giving a “proven” method on how to beat this slot (see the screenshot below). Some say that you need to play 200 spins for fun and then deposit $100. Others promise that if you bet $0.5 per spin and then raise to $2 you are going to trigger the free spins. And it goes on and on. There is one word that summaries all these methods: Bulls**t. Whoever wrote all these methods either doesn’t have the slightest idea on how online slots work or deliberately misleads players. We won’t get here into details on how Random Number Generator (RNG) works, but just say that whether you played 100 spins in fun mode or how you lowered/increased your bet per line has no influence whatsoever on the expected payout. So are there any tricks that can promise you a win? No. But there are things you can do to increase your winnings odds. 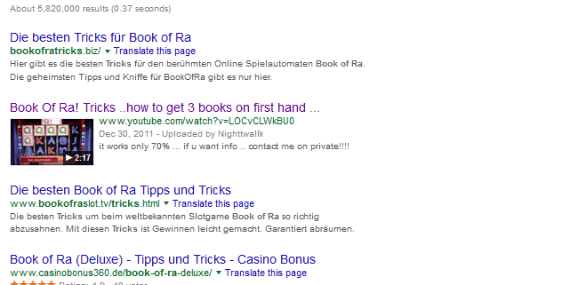 Look for slots with best payout: Book of Ra is far from being the loosest slot online. It’s not even the loosest Gaminator slot. By playing slots with higher RTP you add few % to your chances of winning. Casino Bonuses: Not all casino bonuses are beneficial, but some can definitely improve your odds. For example Mybet casino offers a 100% bonus up to $/€ 500 with just x30 wagering requirements, which is really good. And this bonus is cashable upon the completion of the WR. If you prefer another online casino – not a problem. Just look for a reputable brand with a cashable bonus and low playthrough. Bankroll management: first and most important – play according to your budget and don’t gamble with money you can’t lose. Second, don’t bet everything on 2-3 spins. Your bet per spin should go along with your balance and allow you long playing time. Have Fun: Playing slots is great. It’s fun, exiting and you can win some real cash on the way, but it’s not a way to make money.